The Cairo Criminal Court sentenced former Freedom and Justice Party leader Mohamed Al-Beltagy and Islamist preacher Safwat Hegazy to 20 years in jail charged with torture and leading a terrorist group. Al-Beltagy and Hegazy, along with two others, were given ten years on charges of kidnapping and torturing two policemen at the Rabaa Al-Adaweya sit-in in August 2013. The pair received an additional ten years for ‘being in command of a terrorist group’, while the other two, who were doctors at the sit-in’s field hospital, received five years for joining a terrorist group. 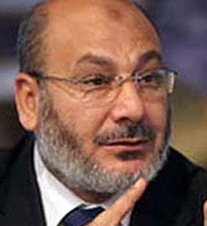 Al-Beltagy, who was Secretary General of the Muslim Brotherhood’s political wing, the Freedom and Justice Party (FJP), dissolved in August, was arrested in a rural village in Giza. Hegazy, a controversial preacher closely associated with the Brotherhood, was arrested on the Siwa-Matruh road, close to the Libyan border in August. The former is also being tried alongside former president Mohamed Morsi and other Muslim Brotherhood leaders for inciting violence outside the Presidential Palace on 5 December 2012. The alleged violence resulted in at least eleven deaths and 693 injuries. In May, the GMBDW reported that Hegazy has been sentenced to a year in prison “with labor” for insulting judges during a recent trial. In February, we reported that Hegazy was one of fourteen Muslim Brotherhood leaders referred to criminal court on accusations of burning an Egyptian national security building. For a full profile of Safwat Hegazy, go here.